Our beloved City of Tampa on New Year's Eve has so many options, you might be overwhelmed by all your choices. With everything from tux-and-tails fancy to suds-and-slides on a porch, there's something for whatever budget, appetite, taste in music, and attire you desire. It's your New Year's Eve, Tampa: do it how you'd like! This list is not in order, because one man's suit and tie is another man's worst nightmare. But it is 18 ways to celebrate New Year's Eve 2018 in Tampa, and they are as different and diverse as they city they'll call home on Sunday night and Monday morning. No matter which one you choose, we hope you have a blast, and start the new year off right! And get home safely! Our friends at Tow To Go will be here for you FREE if you have too many! One of the biggest and best calendar-turning parties every year, after 19 years Club Prana is still the place to be on NYE in the 813. Five levels of celebration, fireworks view from the rooftop, a champagne toast at midnight, and dancing all night long. Tampa's premier New Year's Eve Party. Held on a rooftop in the heart of Downtown Tampa that offers stunning views of the city skyline and fireworks. Entertainment, premium open bar, champagne, and desserts. The place to see and be seen in 2018. Tickets still available for $200, but they increase as it gets closer and might be $225 by the time you read this: it's a sellout every year. "After the show it's the after party" said a wise man from Brooklyn that married a queen. And that's what's going down at the Seminole Hard Rock Tampa: the party doesn't even start until next year, but will go all night long. Make your Uber, designated driver, or babysitter take you to the Rock... which is the one place in town that can serve alcohol after 3 a.m. Just saying. $20 cover. Dress to kill for this 007/James Bond themed party! A Live DJ, casino game room, midnight waterfront fireworks, and plenty more come with the open bar and hors d'oeurves starting at 10 p.m. It's right on the bay, so stick your feet in the water when it becomes 2018. $100. "Where you going to party on New Year's Eve, Preppy?" A.C. Slater himself will be at the new location of Pied Piper's 14th Annual NYE extravaganza, alongside Florida's own "Drop That Bass" legend DJ Magic Mike. There's a new location for this still Tampa event at the TPepin Hospitality Centre, which means Pied Piper's biggest fireworks extravaganza ever! Always a great party and a great spot in North Tampa. Tickets are $79-$135, plus extra for tables. 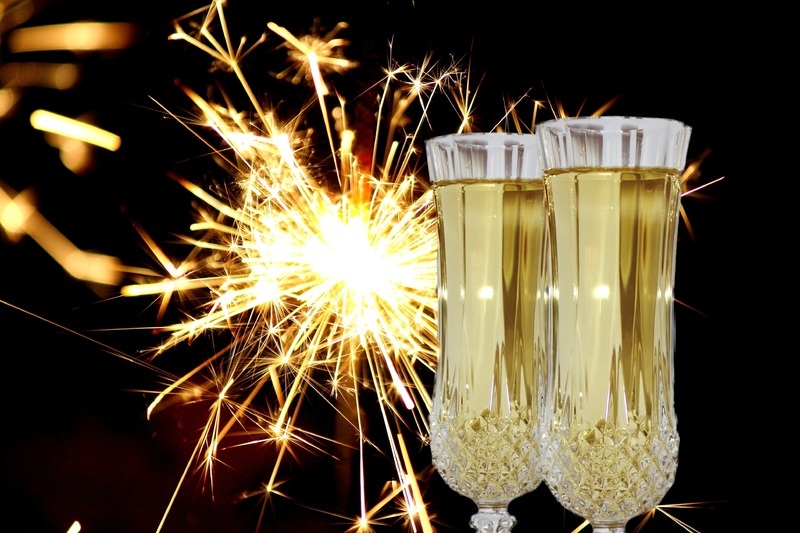 Franklin Manor's NoVIP NYE means no entry fee or cover! Also a live band, DJs, and a midnight champagne toast. There's going to be a line, at both the bar and the door, but a great stop for some easy fun. There's even a complimentary champagne hour from 11:01 p.m. until 12:01 a.m.
Don't let your New Year's Eve be a drag... unless it involves drag queens! The party starts with the parade watch party in Ybor at 4 p.m., has music all day, and with two drag shows at 11:30 p.m. and 1:15 a.m., featuring the Legendary Tiffany Arieagus, the Amazing Jaeda Fuentes, the Talented Kori Stevens and the Fabulous Felicity Lane. Live from Lutz, it's another spot with no cover charge and a free champagne toast at midnight! DJMC JoeBeats will be spinning, with lots of NYE Party favors. Bring a masquerade mask and hide from your friends when you see that cute guy/gal across the bar. $40 for All You Can Drink. It's The Bull, if you're from Tampa you know the deal. And if you don't, wear your boots and be prepared for the latest in line dancing. The $40 includes top shelf all night long, and there's a balloon drop at midnight. New Year's Eve! Yee! Haw! Back to the fancy: Prime views to watch Tampa's largest midnight firework show, champagne, DJ's, dancing... and all on Harbour Island surrounded by Tampa Bay. First-come, first-serve VIP tables & cabanas are available but limited, and also grant access to a special VIP room with extra bars and dance floor. You'll love it. From $65-$175 depending on how swanky you are. For their 4th Annual NYE, Aloft will be 3D mapping their pool, which will create the largest viewing screen in Tampa of the Ball dropping live from Times Square. COOL! Plus a view of the fireworks, Downtown Tampa, The Riverwalk, fire-breathers and dancers... ya know, the usual. There's a VIP ticket with booze and food,plus a regular general admission ticket for you tee-totalers and non-eaters that still want to be fancy. Can we use our SPG points to get in? No? Well then we're gonna need $25-$175 depending our needs in terms of food, booze, and level of fancy. Tampa Bay Brewing Company makes some of the finest suds in the city, and this event includes a three-hour performance by The Clazmatics. Beer and music is always a good way to ring in a new year. No booze, no food, but free! The Henderson Boulevard hangout in South Tampa will let you to treat yourself to any and all of the liquor, beer, and wine they have in the building (ask for an 18th Century Rothschild Burgundy or some Louis XIII cognac... you never know! ), plus all the appetizers, pizza, wings, salad, you can eat as well. All for under a C-Note at $99. Also check the Wednesday night trivia standings... yeah, that's my team in first. Why laugh at the drunk people from your office making a fool of themselves, when you can laugh at a professional unawkwardly? LaBove has performed on The Tonight Show, HBO, Showtime, has two comedy CD's, a concert DVD, and has been touring for over 30 years. Tickets are $16-$18.50. This might be the best bargain in town: New Year's Eve in an historic building, with a retro dance party in the newest speakeasy in Tampa. Enjoy 80's and 90's mixes from DJ Nemesis, plus open bar from 9pm-12am and breakfast. And packages with open bar start at only $25! It's an epic way for you and your squad to party together in funky 80's & 90's outfits, or just to enjoy a different kind of vibe. And Chef Jamie can really cook too, so you'll love the food, that we can promise! Whoa, this is heavy: you can begin 2018 by going back to 1985! DeLoreans! Calvin Klein underwear! Unironic love of Huey Lewis! Lab coats, puffy vests, “Enchantment Under the Sea” dance attire, and other Back to the Future-inspired costumes are encouraged, while heavy appetizers an open bar, and plenty of dancing greet you at one of the icons of Tampa architecture. $99 for all 1.21 Gigawatts of fun. HPC gonna HPC... but this time on a Sunday! Kick off 2018 with DJ Paul Santana, a $10 2hr Open Bar 9-11 ($5 on Staff List), a full three-bar setup on a beautiful outside patio, and two main dance rooms including bars for your "Liquid Courage Moves." Low-cost, high-energy. Looking for more ways to celebrate New Year's Eve in Tampa? We've got you covered at 813area. And you can also register for the cover price of free!